Franklin's Gardens will host the 2018/19 Tyrrells Premier 15s final on Saturday, April 27 (kick-off 5.45pm). The top four teams in the elite women's rugby competition will progress to semi-final play-offs, played at the home ground of the top two teams on April 13/14, with the finalists competing for the title two weeks later. The Tyrrells Premier 15s season kicked off on September 8, with 10 teams competing in a league format with home and away fixtures. 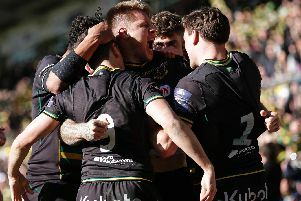 “We are very proud to be hosting 2018/19 Tyrells Premier 15s final at Franklin’s Gardens and look forward to making it a memorable occasion,” said Saints CEO Mark Darbon. “Women’s rugby continues to thrive across Northamptonshire and the East Midlands. "In August the club held its first girl’s coaching camp and events like the Redrow Homes Girls 7s are hugely popular. Nicky Ponsford, RFU head of women’s performance, said: “Tyrrells Premier 15s continues to go from strength to strength and we consider Franklin’s Gardens an excellent venue demonstrating our commitment to developing women’s rugby in England. “As the Tyrrells Premier 15s continues to go from strength-to-strength, nurturing new rugby talent, the final will be the culmination of a second exciting season for this leading women’s rugby competition."